← Too hot to knit? So, as this week’s yarny activity, I pulled all my knitwear out of the cupboard to give it a good airing and to check for moths. Touch wood – no sign of them. Phew! As I put everything back, I fixed a couple of pulled threads and I set aside a couple of items that I don’t wear. 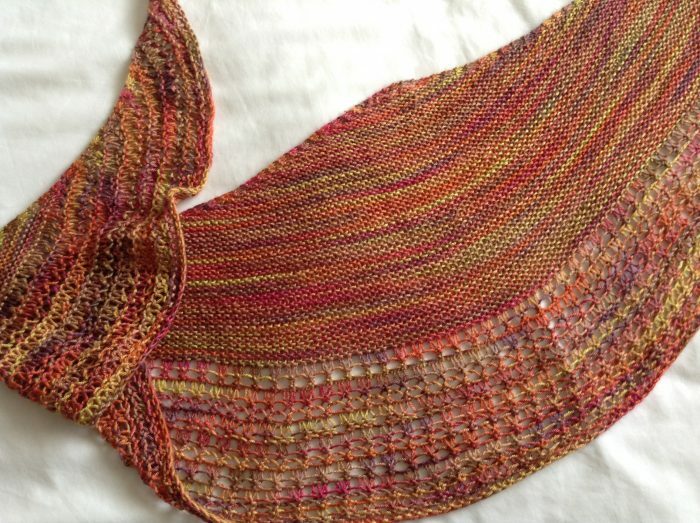 I loved the yarn of one shawl in particular, and liked the general pattern, but have never been able to overlook the little “hump” along the top edge, in spite of vigorous blocking. 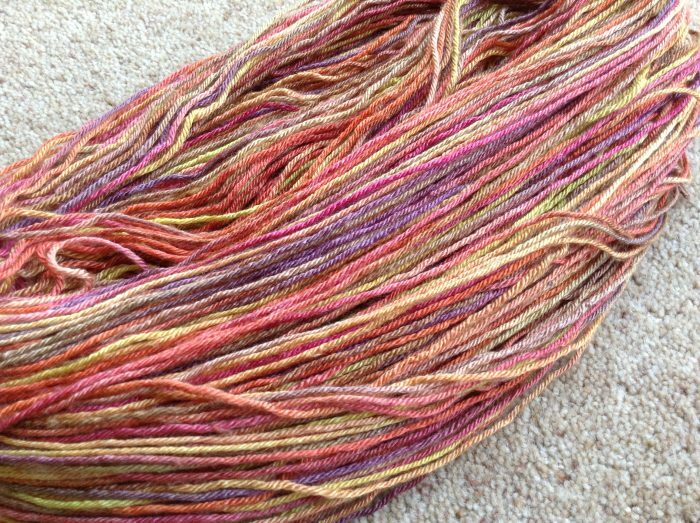 The merino-silk hand-dyed 4 ply deserves to be something wonderful to showcase the beautiful autumnal colours, so if you have any suggestions for suitable shawl patterns, please let me know! Are you knitting in the hot weather? Have you made any changes to your yarny activities? I’d love to hear how you’re getting on! Stay cool and happy crafting! This entry was posted in Uncategorized and tagged Autumn, Shawl, skein, stash, Wool, yarn. Bookmark the permalink. It‘s a lot cooler here, so not looking for alternatives!! But had to ditch a whole Wip today after I found more moth clues :(( Although to be fair it had been languishing for a couple of years so no great loss. A sweater‘s worth of alpaca though 😮 I could probably have saved a good portion but didn‘t love the orange so much any more. Love these colours though…! Azzuzz?